Boyzone is an Irish boy band. Its most famous line-up was composed of Keith Duffy, Stephen Gately, Mikey Graham, Ronan Keating, and Shane Lynch. Boyzone have had 19 singles in the top 40 UK charts and 21 singles in the Irish charts. The group have had 6 UK number one singles and 9 number one singles in Ireland with 12 of their 20 singles in the UK being in the UK Top 2. Eventim is the place to look for Boyzone tickets and tour dates. 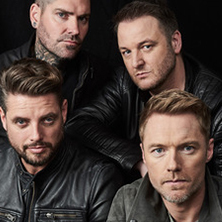 To be the first to hear when more Boyzone tickets go on sale you can sign up to the Eventim Ticket Alarm below.